After games in two different cities, travel to a third market in a different time zone, and a few hours off to watch the Super Bowl, it was back to work today for the Manitoba Moose. 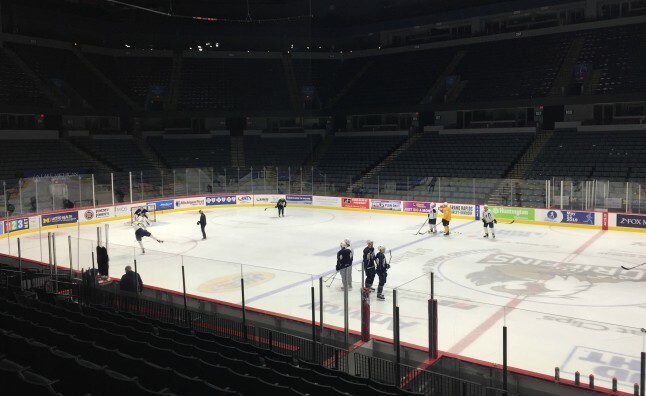 The Winnipeg Jets’ American Hockey League team practiced in Grand Rapids, Mich this afternoon ahead of Wednesday’s date with the Red Wings’ affiliate. Friday saw the Moose returned from the all-star break with an overtime win in Milwaukee before losing 5-2 in Chicago Saturday night. The loss in Chicago marked just the second time Manitoba failed to earn a point in twelve games. Seth Griffith extended his point streak to 11 games with an assist Saturday. With 15 points (1G, 14A) in that span, he’s now Manitoba’s top scorer. The Moose have looked like a more confident team since their return from the holiday break, and the results have backed that up. Besides putting a nine-game point streak together, Friday’s win in Milwaukee was a solid effort that avenged an 8-2 loss to the Admirals in the last contest before the all-star break. But, Saturday’s loss in Chicago was a tough one with the Wolves proving to be a handful. So are the Moose a little shaken? No way says assistant coach Eric Dubois. Goalie Eric Comrie had gone nine games without losing in regulation time before Saturday’s loss in Chicago. The fourth year pro leads the AHL in minutes played (1905:57), saves (986) and sits tied for fifth in save percentage (.921) as a new week begins. Defenceman Nelson Nogier skated Monday with a full face shield and non-contact jersey. Nogier took a puck to the face early in Saturday’s loss to the Wolves and did not return. The Moose close out six straight away from home Wednesday in Grand Rapids, Mich. in a game you can hear on TSN 1290, moosehockey.com, the Moose App or stream live on AHLTV.